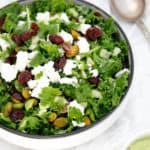 Green Goddess Kale Salad is a vegan nutrient & taste sensation. The delicious salad inc cranberries, pistachio & green apple with a creamy avocado dressing. Place all the dressing ingredients in the TM bowl. Blitz 15sec/Speed 8. Remove from the TM bowl and refrigerate until needed. Place half the kale in TM bowl. Chop 3 Sec/Speed 6. Reserve chopped kale in a serving dish. Add remaining kale in TM bowl. Chop 3 Sec/Speed 6. Add to kale the serving dish. Add the chopped apple to the kale. Using a spoon toss the apple through the kale. Add cranberries and pistachio to the kale mixture. Crumble feta or tofu over the salad. To serve you can either toss half the avocado dressing through the salad or serve the dressing on the side for people to add their own. PLEASE NOTE: The avocado dressing recipe makes more than you may need so just add as much as you require to the salad. The dressing is amazing served on grilled fish or chicken. It can also be used as a sandwich spread. Store the dressing and salad in the fridge. The dressing will last 2 days without discolouration.